Ever have one of those nights where you don’t feel like cooking but you are starving? 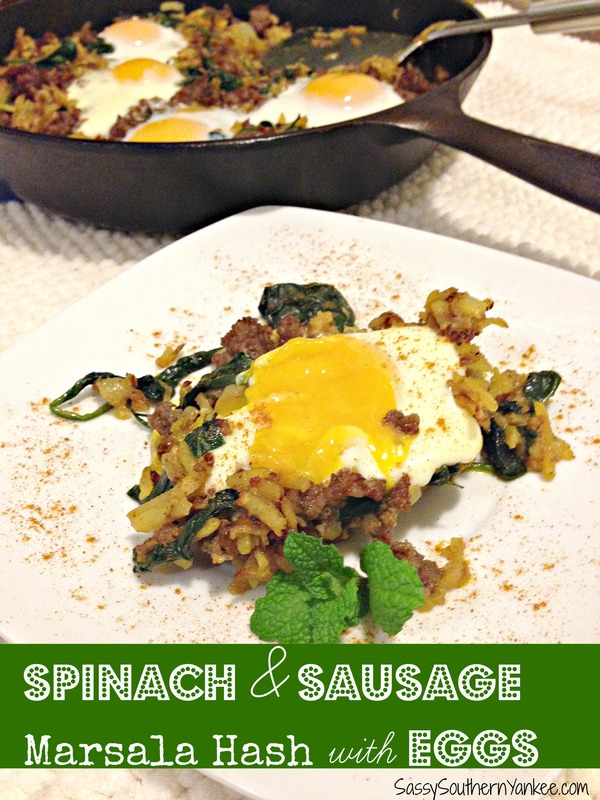 Yeah that’s what happened the night I created this Spinach & Sausage Marsala Hash with Eggs. I wanted to have breakfast because well breakfast is my favorite meal of the day but I wasn’t in the mood for my normal go to recipe. That my friends is when things started to get a bit crazy. As I stared into the fridge I started pulling out ingredients thinking “what if?” With my hodge podge of food in tow I started to create this what I can now call amazing Spinach & Sausage Marsala Hash with Eggs (sorry the pictures aren’t the best it was a doom and gloom kinda day). Ok, to get the party started in a large skillet cook the sausage using your spatula to break it into pieces like you would with making tacos. If you’ve never made taco’s I’m sorry for you on multiple levels let me know and I will be a bit more descriptive. Once the sausage is cooked remove from the pan and place in a bowl. Next add the spinach to the same pan and heat over low heat allowing it to wilt. I sprinkled it with a bit of salt to help it wilt and of course to add a level of flavor. Tasting your foods and seasoning as you cook is always a good idea. 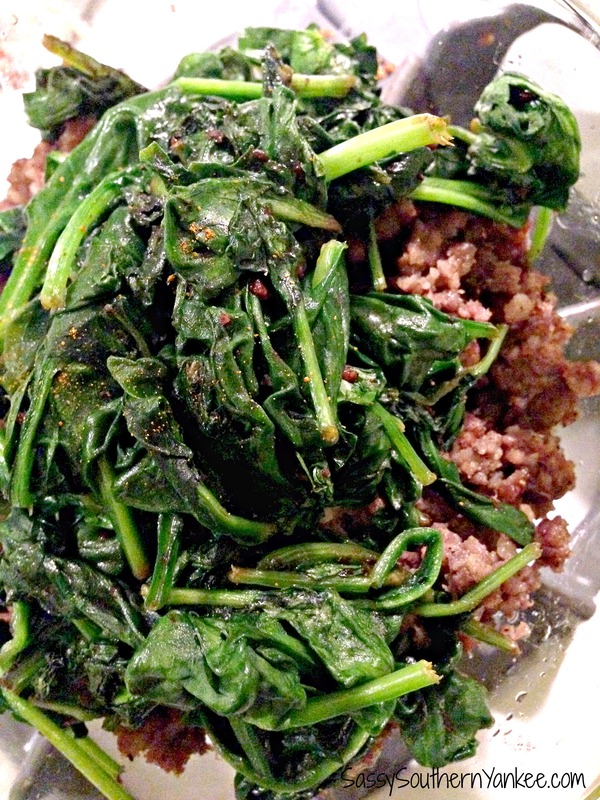 Once the spinach is wilted add it to the bowl with the sausage and set aside. I the same skillet add 1 teaspoon of canola oil and the diced onions. 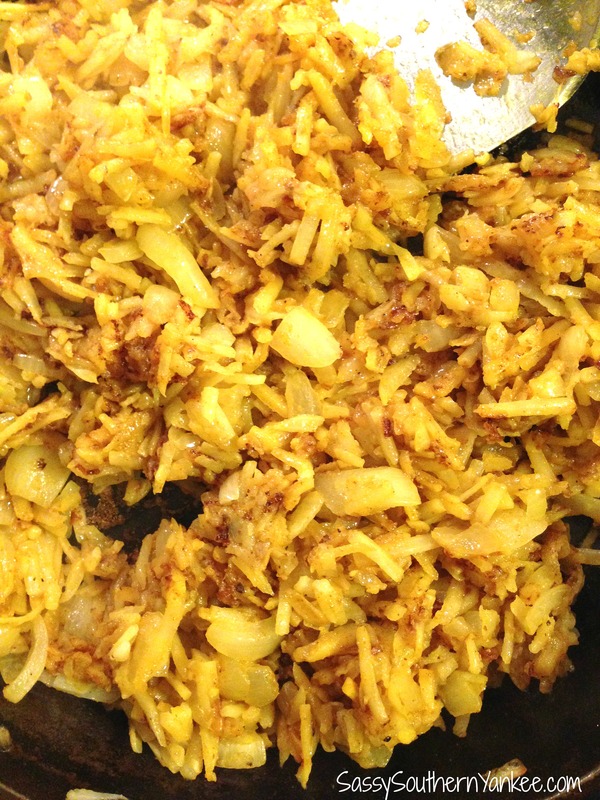 Sauté the onions over medium heat until they are translucent; add the masala and cook for an additional minuet. This will allow the flavors to “wake up”. Add the remaining 2 Tablespoons of oil to the skillet; then add the frozen potatoes. Cook the potatoes and onions periodically flipping using your spatula, so that the potatoes cook evenly. I prefer to have my potatoes a golden brown and crispy. You will want to cook them just a touch less than you normally like to eat them. Once the potato onion mixture is at your desired doneness; add in the spinach and sausage. Combine the ingredients until evenly mixed throughout. Crack the eggs over the Masala Hash mixture making sure each egg has a little nest to sit in. Place the skillet into the oven at 400* and bake for 10 minuets or until the eggs are cooked to your desired doneness. Ok, to get the party started in a large skillet cook the sausage using your spatula to break it into pieces like you would with making tacos. If you've never made taco's I'm sorry for you on multiple levels let me know and I will be a bit more descriptive. Once the sausage is cooked remove from the pan and place in a bowl. I the same skillet add 1 teaspoon of canola oil and the diced onions. Sauté the onions over medium heat until they are translucent; add the masala and cook for an additional minuet. This will allow the flavors to "wake up". 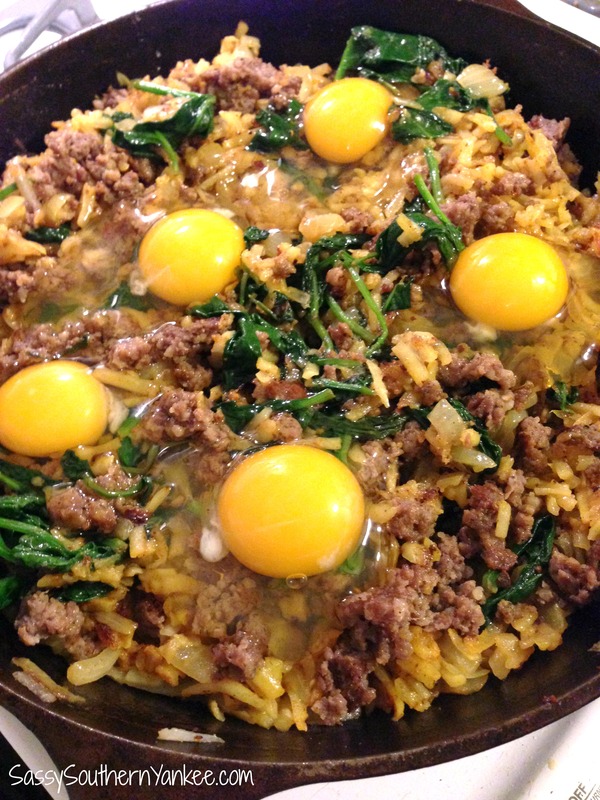 This entry was posted in Breakfast and tagged Brunch, Curry, Eggs, Gluten Free, Hash, Masala, sausage, Spinach, Taste of India.